Our guitar instructors teach rock, blues, metal, country and classical styles on both electric and acoustic guitars. Beginners work on chords, simple songs and melodies, sight reading and theory. Each lesson will challenge you with a new technique or music theory, and ends with something fun – such as your favorite riff or song. 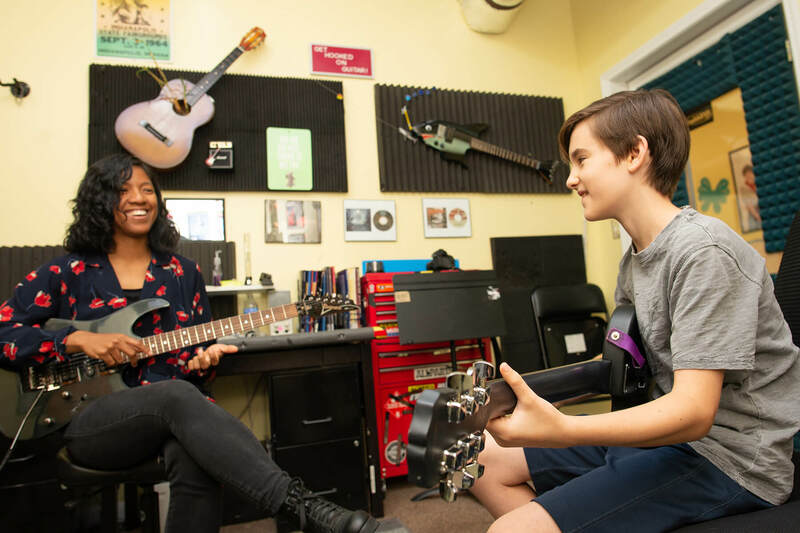 We employ a variety of guitar method books based on student needs and preferences, and encourage students to bring smartphones or CDs to their lessons to learn their favorite tunes. What’s the #1 reason to study guitar at the Academy? 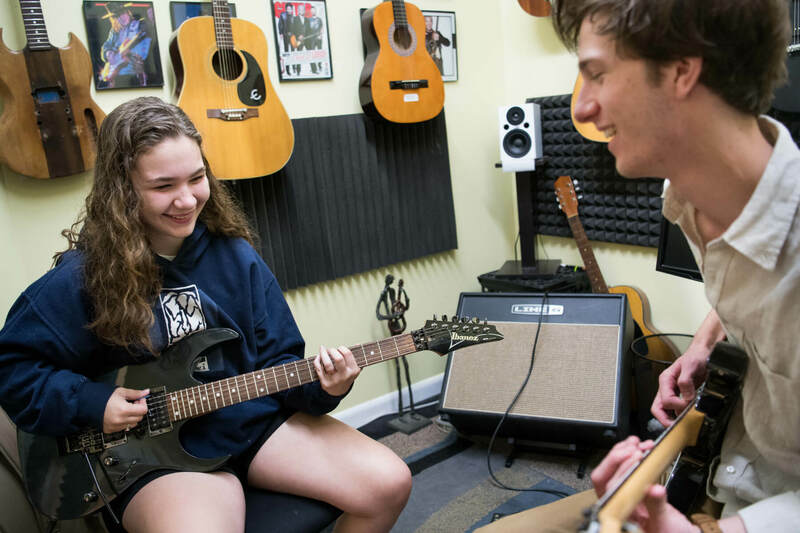 Our guitar instructors are warm and friendly, and get to know each student and parent on a personal level. We work with you to craft a lesson plan that fits your individual needs and the student's favorite type of music. Whether you're playing in local bands, a seven year old taking their first lesson, or a fifty year old returning to the guitar after many years, we’ll set goals to achieve your musical aspirations. ‍What styles of guitar do you teach? We teach all styles, from rock, pop, jazz, and blues to metal, country and classical guitar – on electric and acoustic guitars. How qualified are your guitar instructors? Our guitar and music instructors have received their education from prestigious institutions such as New York University, Indiana University, the Berklee College of Music, Oxford University, the University of North Carolina School of the Arts, South Carolina Governors School for the Arts, the Atlanta Guitar Institute and Columbia College. Many have toured the US and Europe, and bring over 25 years of professional performance and teaching experience to your lessons. What will I learn from guitar lessons at the Academy? Beginner guitar students can expect to work on chords, simple songs and melodies, sight reading and theory. 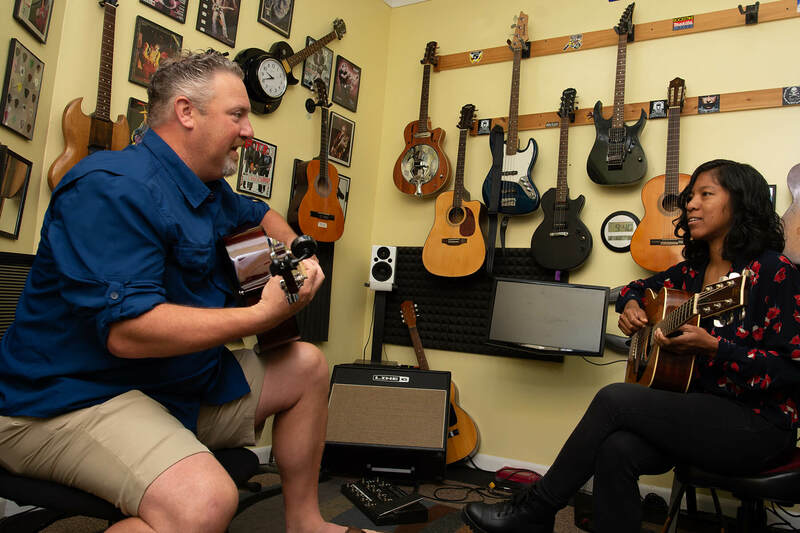 Our instructors balance musicianship and fun by making sure that each lesson presents a new technical challenges or theory concept, and ends with something fun, such as your favorite riff or song. We use a variety of guitar method books, and encourage students to bring their smartphone or CDs to their lesson to learn their favorite tunes. Do I need to purchase a guitar to learn the instrument? 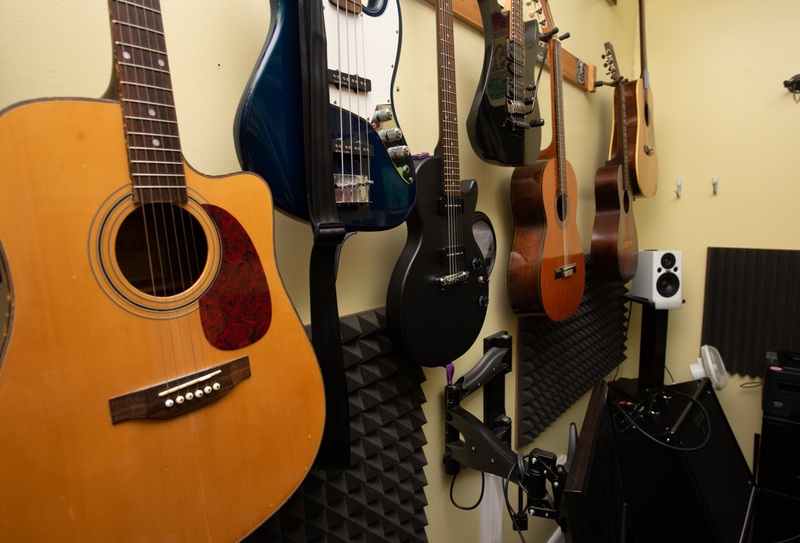 The Academy offers acoustic and electric guitars for student lessons (for your convenience, students can use one of ours at their first lesson). But to practice at home, you will need a guitar. We offer a variety of instruments appropriate for beginners, starting at just $89.00. Take the next step call 803-667-4451 now to grab a great lesson time as space is limited. Or you can email us, or request more info. Lessons are available seven days a week, and scheduled once a week. A one-time registration fee is $25. Interested in a different instrument? It's easy to take the first step. Ready to start? You have nothing to lose. Sign up is easy and parent-friendly, with helpful staff at the front desk seven days a week to serve you. Because we only offer lessons on a month-to-month basis, there are no large upfront payments, no complicated contracts, no annual material or performance fees, and no semester minimums. Lessons are first come, first serve, so contact us today to arrange your first lesson! Lessons are available seven days a week, and scheduled once a week. A one-time registration fee is $25 (due only at time of registration). We'll never share your information. We simply want to keep you informed of all the cool things happening at our music academy. Offering quality guitar, voice, singing, bass, drum and piano lessons at three convenient South Carolina locations: Columbia, Lexington and Irmo. All Images & text property of Columbia Arts Academy.